Indie Retro News: Chasm - A 2D Action Platformer - Launches Tomorrow July 31st - Discount Coming Soon! Chasm - A 2D Action Platformer - Launches Tomorrow July 31st - Discount Coming Soon! It is with a combination of pride, exuberance, relief, and fear that Bit Kid is hereby officially announcing that Chasm will be launching tomorrow July 31, 2018 for $19.99! They will be doing a week 1 discount on Steam, so keep an eye out for it. Chasm is an action-adventure game in which you play a new recruit undertaking your first mission for the Guildean Kingdom. Thrilled to prove your worth as a knight, you track strange rumors that a mine vital to the Kingdom has been shut down. But what you discover in the mining town is worse than you imagined: The townspeople have disappeared, kidnapped by supernatural creatures emerging from the depths. 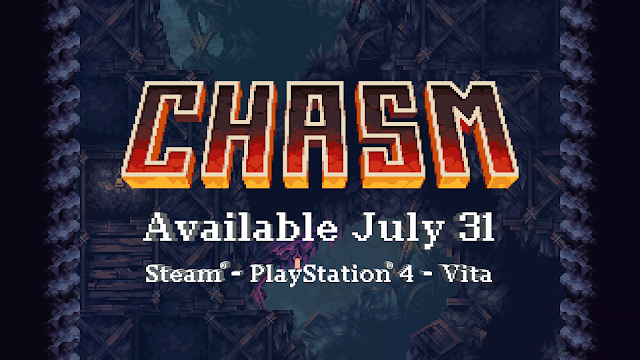 Chasm will be available for Windows, Mac OS X, SteamOS + Linux and PS4/Vita.